Printing Speed: Max. 80 imprints / min. "स्टार प्रिंट इलेक्ट्रो मैकेनिकल कॉन्ट्रैक्ट कोडर मशीन, EMC 35"
It is suitable for all manual & automatic coding on Cartons, Tin, Pouches, Foils, Plastic containers, labels & majority of packing materials. - Printing Area: 25MM X 35MM. 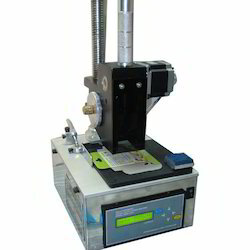 ascent Packaging Systems make compact motorized intermittent coder for on-line or table top registered printing of Batch. No., Mfg. Date, Max Retail Price, etc. 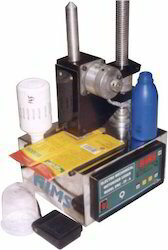 On any Intermittent From Fill Sealing Machine (FFS) for Oil, Milk, Ghee pouches and on Rigid Containers, Cans etc. Vilax electro mechanical contact coder (EMCC) is suitable for all fully & automatic coding on products where coding is statutory means "no code no run".